It seems that just about every yearand usually in FebruaryeBay announces changes that largely displease the great majority of eBay sellers. This is much like that annual family gathering where someone always steps over the line. The transgression typically leads to some fireworks and angry exchanges, but in the end the family hangs in together, tending the wounded, smoothing ruffled feathers and getting back to the business at handusually eating and gossiping. eBay's most recent changes caused more than the normal amount of stir when the company revamped its feedback system. Sellers went on strike. Many talked of walking away, never to look back at the shores of eBay again. But since the initial sting of the announcement, most sellers have found ways to work within the confines of the new system. Their jobs may be more complex now, but this is a resourceful group of people. Despite the justifiable frustration they feel, most have recognized that eBay represents a revenue stream that isn't easy to replace. Let's look at this year's biggest changes to eBay's feedback system. We'll save the firstthe fact that sellers may no longer leave their buyers negative or neutral feedbackfor another article. It should be a doozy! The other big change to the system is the use of Detailed Seller Ratings (DSRs) data to influence search results. As you know, after a transaction buyers may anonymously rate sellers on four different criteria: How accurately the seller described the item, communication, shipping speed, and shipping and handling charges. The rating system goes from one to five stars. As a seller, your goal is to get as close to a perfect five as possible, on each of these criteria. And if you aspire to be a PowerSeller, the bar's higher than ever. Sellers have long focused on the importance of high feedback ratings, but now there are new incentives to keep ratings as high as possible. eBay is not only collecting and showing this data, it's also using it to determine where a seller's items appear in a buyer's search results. The higher your rating, the higher your product placement will be in Best Match search results. Since Best Match is the new default sort setting, this is very important! Also, PowerSellers who have maintained DSRs of 4.6 or 4.8 for the past 30 days qualify for discounts on their final value fees of 5 percent or 15 percent, respectively. When we were in school (just a few years ago) we remember feeling just fine about getting a grade of B or B+. To us, a B was quite a good grade. eBay has now pretty much thrown out the grade book we're all familiar with and rewritten the rules, so that Bs are not so hot. Now, anything less than an A or A- will bump you way to the back of the classroom. Many buyers simply don't understand the meaning of the ratings from which they now can choose. Many view a 4 rating as a fine response, if they received the service they had hoped for. On a scale of 1 to 5, a 4 does seem like a good "grade." It's what they may give a seller, for example, if an item arrived on time and as expected. This means you can do everything right, and still not get that "wow" response many buyers save for a rating of 5. Also, because buyers have to give sellers four grades at once, they may feel uneasy about leaving all 5s, thinking they're not being discerning enough. So again, they may leave a 4 just to show they're really paying attention. From a seller's viewpoint, such grades are barely passing. Ouch! What's a seller to do? According to Platinum PowerSellers Andy and Deb Mowery of debnroo, as well as members of the Internet Merchants Association, the best way to address the new rating system is to "coach" buyers about the importance of the ratings they leave, and why they shouldn't hesitate to leave a 5 rating if everything was fine. "When you give 4 stars, it may seem like a great score, for instance a 4 in Shipping Time means "Quickly;" eBay, however, considers this a sub-par mark. Their standards require sellers to maintain 4.8 & above or be penalized with higher fees & more. If you were pleased with this transaction, please respond with all 5 stars! If you are not pleased, let me know via e-mail, and I'll work to make it that way. Let's work together to make a great community, full of fabulous bargains & fun for all." Sellers who are already operating on razor-thin margins (and finding one who isn't is getting difficult) may resent having to take this added step. However, as things stand now there's little choice. Perhaps the best way for sellers to gain back some lost time is to shave time off another part of their operations. One way to do this, of course, is by using auction automation software like Auctiva (and no, we weren't asked to suggest that!). Also, keep close track of your standing through your Seller Dashboard, which is available to all sellers who have at least 10 DSRs. More information on Detailed Seller Ratings is available here. You'll notice that eBay also has some ideas for how sellers can improve their ratings. So if you're still feeling a little bruised from this year's "family encounter," these tips may help. Just remember, it's true: What doesn't kill you makes you stronger! 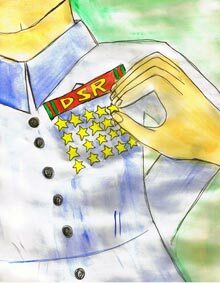 Earn higher DSR marks with a few simple adjustments.